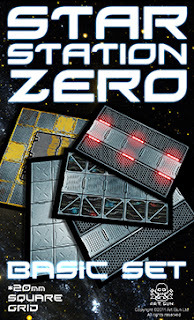 These are a bit late, but I finally had a chance to take some photos of the assembled Star Station Zero Basic Set. Jon at GZG very kindly gave me permission to use my painted UNSC and OUDF models in the shoot, which is much appreciated. When I ordered the hooded cultists, I had a look around the 15mm.co.uk site for some monsters to use for Eldritch Horror games. This guy and his pig-nosed friend (not yet painted) made it into the order. He was in the sci-fi section listed as a space Daemon. He was a lot bigger than I expected, but should be useful anyway. 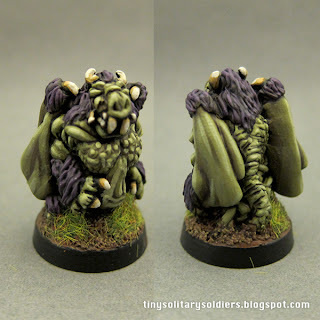 I've seen a lot of Mythos art depicting the creatures in a sickly greyish green palette and I want to keep that as a theme in my collection, so I went with GW Foundation Gretchin green as a basic colour and used the ubiquitous Devlan Mud to wash it. 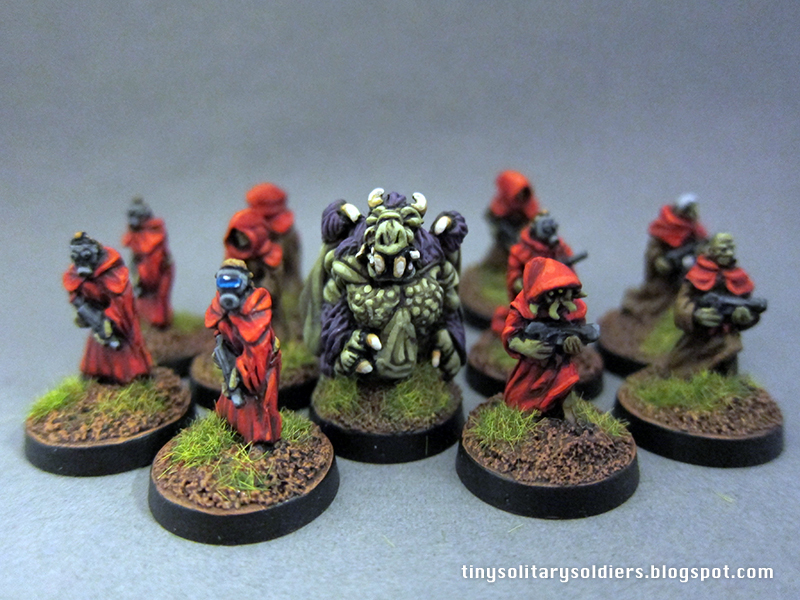 Then came many many gradual highlights mixing white into the Gretchin green. Initially I did some good old fashioned wet-blending on the wings, but at 15mm table scale you could barely see it, so I did the bolder unblended highlights and it looked better. You may not be able to tell, but a lot of my highlighting is just use of small, well chosen blobs. I think it's closer to the 28mm Foundry house style than to GW stuff. 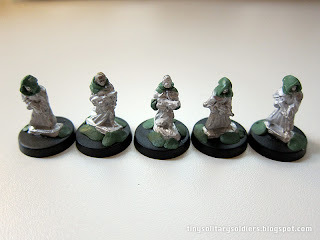 One odd thing about photographing minis for the web is that they always look completely different to how they look to me on the table. Paintjobs that look great at gaming distance often look a lot worse close to the camera. To join the forces of order, are two figures from The Scene. Both are Zombie hunters/survivors. 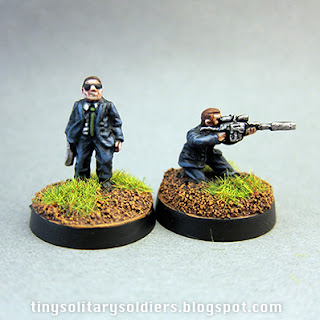 Great models and I have a few more from the range too coming up. 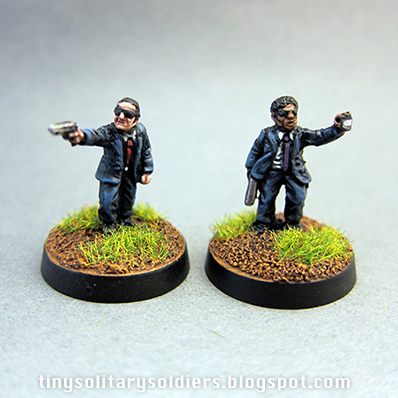 I kept them in mostly black and denim to work with the agents. The male character's arms look a bit strange in the photo, but it's just the angle.. The right arm is bent at the elbow. I'm really enjoying a diversion from Sci-fi models right now and reading a lot of HP Lovecraft is making the whole project more fun too. Next on the queue is probably the GZG Alien Mercs I finally ordered but haven't painted yet.. But I don't know, 1920's conversions of my remaining stock of The Authorities may edge them out. I'm so hooked on Eldritch Horror it's crazy. 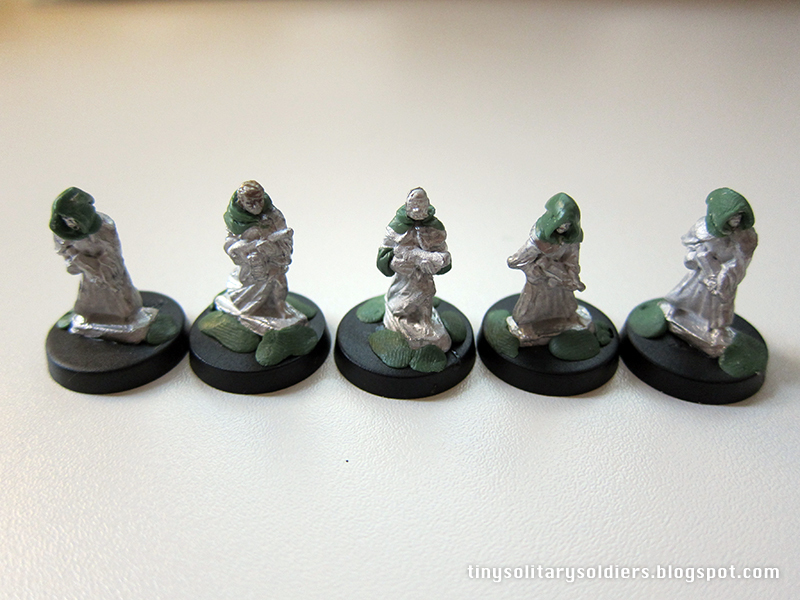 Maybe my unpainted Khurasan Zombies.. They are good for any era. 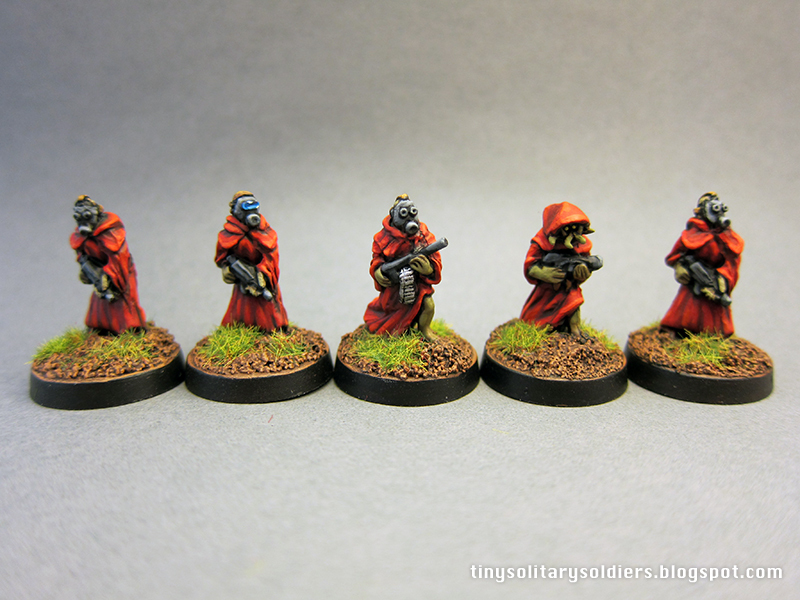 I have finished the remaining cultist models that I've been converting out of 15mm.co.uk figures this week. 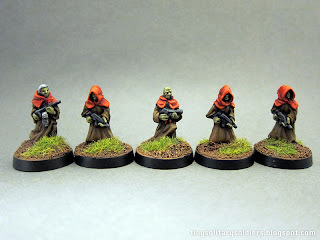 I went with a red hood to tie them to the other figures, but gave them brown cassocks to indicate they are more lowly that the Inner Circle models, or the other hybrid cultists. This was my most in depth sculpting attempt so far.. Which isn't saying much really as it was just hoods, but I'm glad I tried and will probably attempt more sculpting in the future. Here are some photos of the build. Jon at Khurasan only just gave me the go-ahead to post this, so here it is, hot off my paint desk.. (Or the depths of Hell.. Whichever makes more sense) Great Bah-He-Mot! 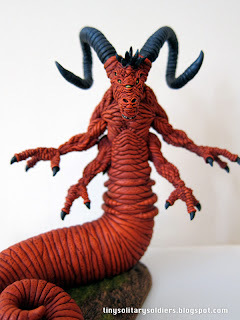 A huge resin demon in the Eldritch Horror range. Like the Octo God I painted for Khurasan earlier this year, the model is beautifully sculpted and cast, very easy to assemble and paint, with secure pins cast right into the pieces. The pins are square so it's easy to see if you have the bits in the right way, and are good and snug. The metal horns almost didn't even need glue. I also did some imps, which are very tiny and visible in the photo below, which shows the size of this model. I've got lots more Eldritch Horror stuff on the go, so you can expect some updates all weekend, and hopefully a solo battle-report using Fear and Faith sometime soon. When I compared all these points to Ganesha Games "Fear and faith" it compared very favorably with it's good points, has a more robust weapons list and seems more flexible... But the final blow is that it only costs about $7 as an instant PDF download. Victory and purchase goes to Fear and Faith. So goodbye Threshold Agency, Hello just plain "The Agency". 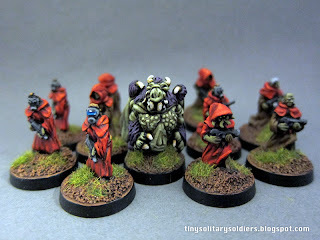 Luckily for me I have a bunch of modern minis from The Scene that are perfect for the task. I have all the models from the Zombie hunters, Authorities and Special forces lines, including some doubles for conversions. As I've been a bit overcome with greenstuff sculpting this week, I'm going to make some more 1920's looking models out of the doubles with the help of GZG boonie hat heads. This is brilliant.. I hate Boonie hats so they would have gone to waste otherwise. I was originally going to do all the suits in different colors to look more like plain clothes detectives but at the last minute decided to paint them more like a unified "gang" and went with black suits. I used GW Shadow grey to shade them , then Badab black wash, then final tiny highlight of shadow grey again. They don't look black so much as bluey-charcoal, but I'm pleased with the result as it helps them stand out on the table. I did give them all color coded ties to help me ID them. Thought it was kind of good fluff too. The model flashing his ID would make a great preacher with a holy symbol with minimal work. I will probably make one up at some point. These two gave me some trouble. The kneeling figure was not well cast at all and looked like a melted wax-man. It took some serious painting to fake a face onto his head, which was almost featureless. Mr. Orange was ok, but I couldn't figure out how his hand worked holding the gun. I just kind of blustered through it. Mr Greene's craggy face wasn't easy to paint either. It looks OK on the table so I've stopped now. I don't normally do metallic guns on my minis, but these guys were so dark that black guns highlighted grey would have just been invisible, so I painted all the weapons mithril silver with a black wash. Wonderful minis, the high level of close detail on the heads made them tricky to paint, but I'm already thinking of getting some more. 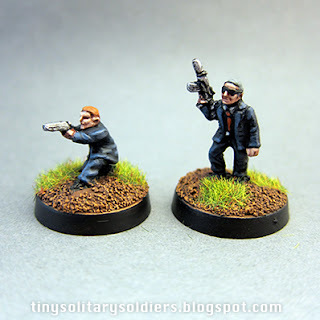 They are very versatile for any noir or modern style conversions thanks to the good range of poses and well sculpted suits. My Eldritch Horror collection is growing at an alarming rate! I'm reading "The Shadow Over Innsmouth" at the moment too., which is only making it worse. 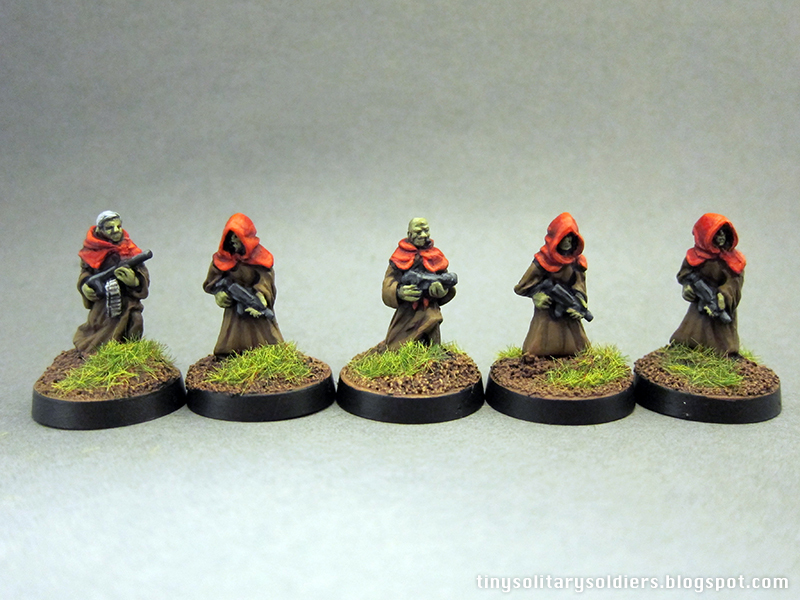 These are all 15mm.co.uk hooded cultists with the (terrible looking) heads snipped off and replaced with GZG gas mask heads and a spare Octo-God cultist one I had left. Although 3 of them are identical, the greenstuff hoods and head poses make them look surprisingly different IRL. 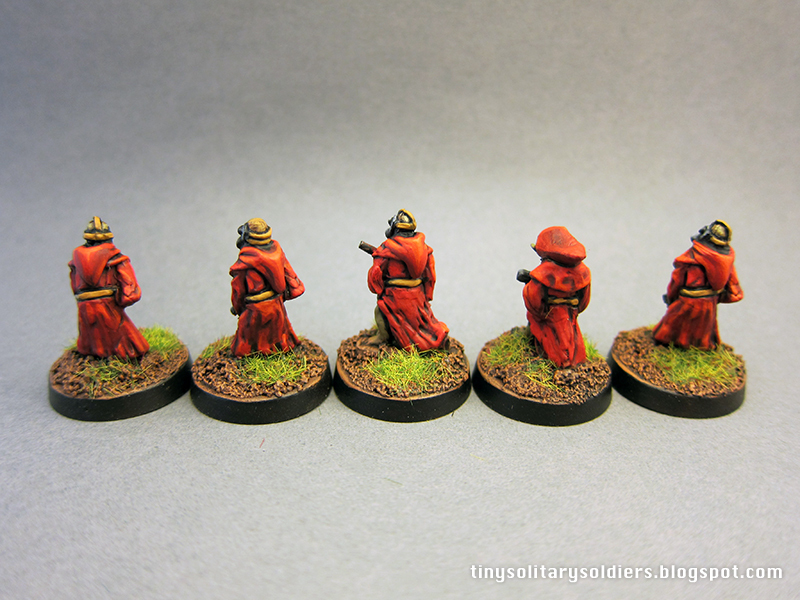 They were quite difficult to paint.. Or rather I should say I made my job difficult by over-complicating it. I used washes to "knock back" the savage highlights a couple of times and it backfired, drying too dark and making me highlight again and again. The moral of the story is use a red glaze to unify a red paint scheme, do not use brown ink. The guns were also very soft in the detail.. I found I had to be very clever with highlights to pick out a shape. All in all a fun and inexpensive project though. I will continue ordering stuff from 15mm.co.uk as they have a large range of eclectic "vintage" looking models that can be quite useful. 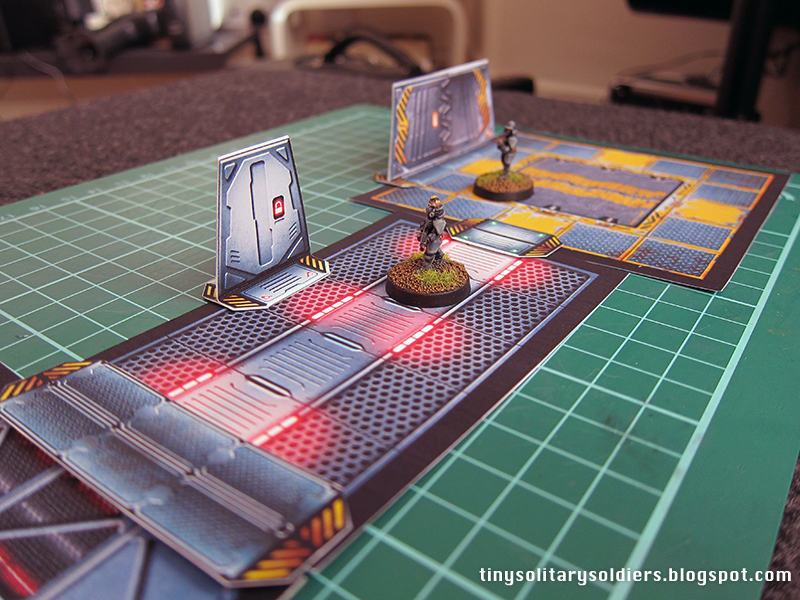 Up next: "Threshold agents" in 15mm. Ok folks, here it is.. A long awaited basing tutorial. 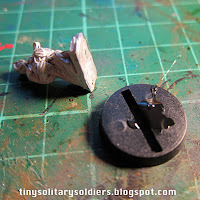 Honestly this is nothing special and this method is quite old as far as I know, but a lot of readers want to know how I do my bases so here it all is in detail. Glue the mini to the base with superglue. I use 20mm plastic round bases. 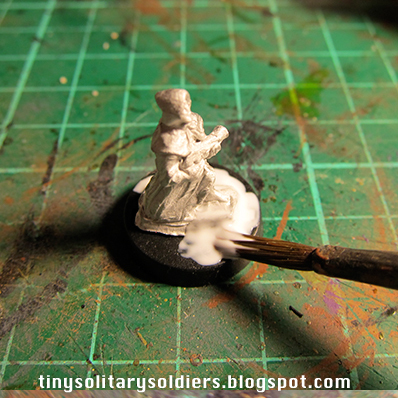 Using a largish (but crummy) brush, paint on UNDILUTED PVA glue all over the top of the base. I glob it on quite thick as a lazy way to try to blend the cast base with the plastic one. Stick the whole base into some fine sand. When I was a kid in Sydney, this could usually be found lying around for free.. In the UK I had to pay for a small bucket. Oh well. Allow to dry. I usually leave the base submerged in the actual sand tub. Once the base is completely dry, shake off the excess sand and paint on a thin layer of DILUTED PVA (That is, PVA mixed with water in a roughly 2 parts PVA to 1 part water mix) to seal the sand down and make it easier to paint. If you don't do this, sometimes the sand will come off when you are drybrushing. 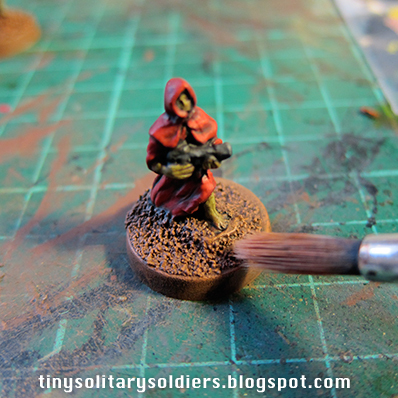 Paint a mid brown colour onto the base. You can be fairly sloppy just make sure you get solid coverage on the sand. Try not to paint it on too thick though. 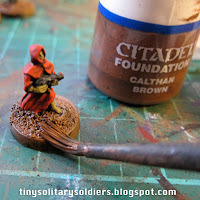 I use Citadel Calthan Brown Foundation paint. I think it's tops. WASH the whole base with Citadel Devlan Mud wash, or alternatively some other kind of very dark brown or black wash. I didn't take a picture of this, sorry. Allow to dry. 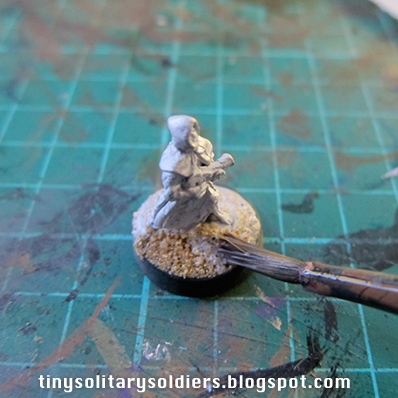 Once dry, drybrush the sand with the base colour again a little, then with 2 lighter shades. 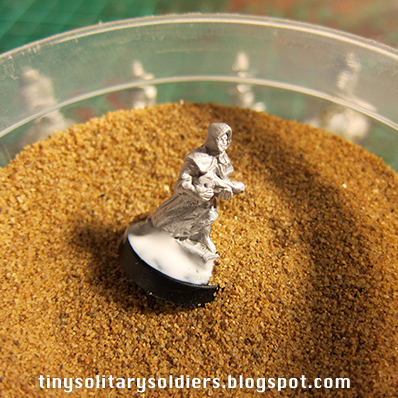 Now that the sand is finished, tidy up the edge of the base with black paint. I think it looks classy. Using your crummy brush, dab on some thick blobs of UNDILUTED PVA where you think some grass would look good. Personally I do it where I've made mistakes or there are obvious gaps I should have filled but was too lazy. Sprinkle on static grass.. Preferably in big lumps. Leave the model with a thick clump of the stuff on it until it dries. Make sure you leave it a good long while otherwise too much will fall off. 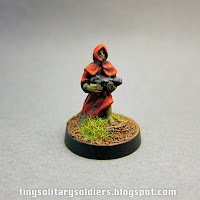 This model was a hooded cultist from 15mm.co.uk. It's not a very good one.. Look at the size of it's hand compared to it's head! I got around this by painting it sickly green and calling it a hybrid.. Although for the others I did some converting as seen last week on this blog. 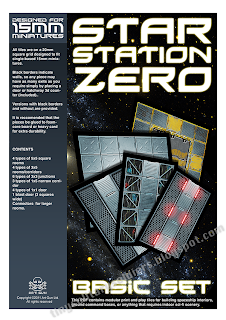 Star Station Zero: 15mm starship deck plans Basic set NOW AVAILABLE! The wait is over! 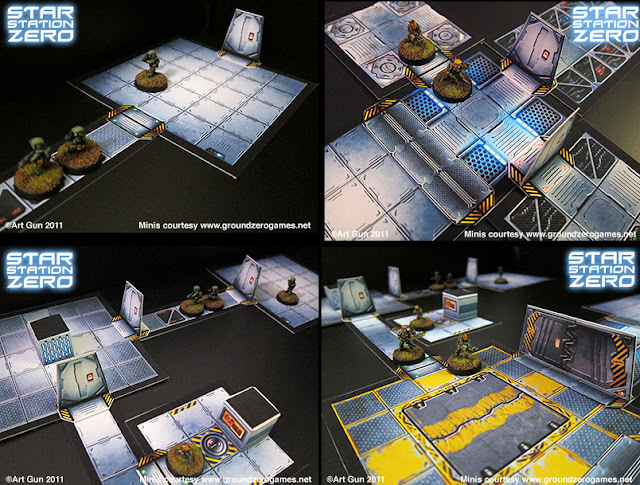 I will be announcing on TMP as soon as possible, but as of now, the 15mm deck plans are now complete and available to buy from RPGnow as you read this post. 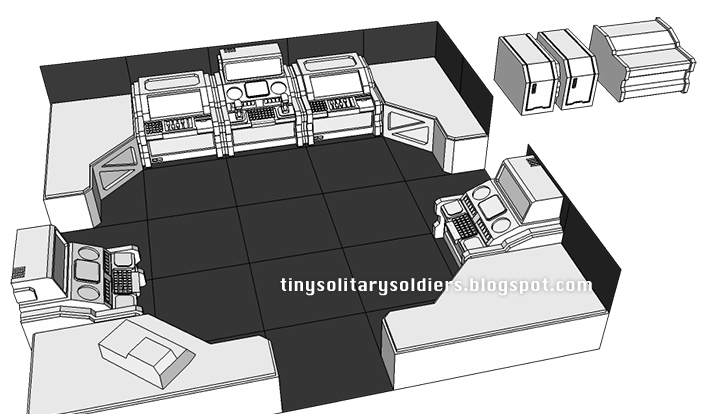 The set contains 7 pages of tiles and props and I believe represents very competitive value at just $5.00 USD (By today's calculations, that's only £3 for UK folks) so come on, for the price of a sandwich you can print out as much starship interior as you could ever want. 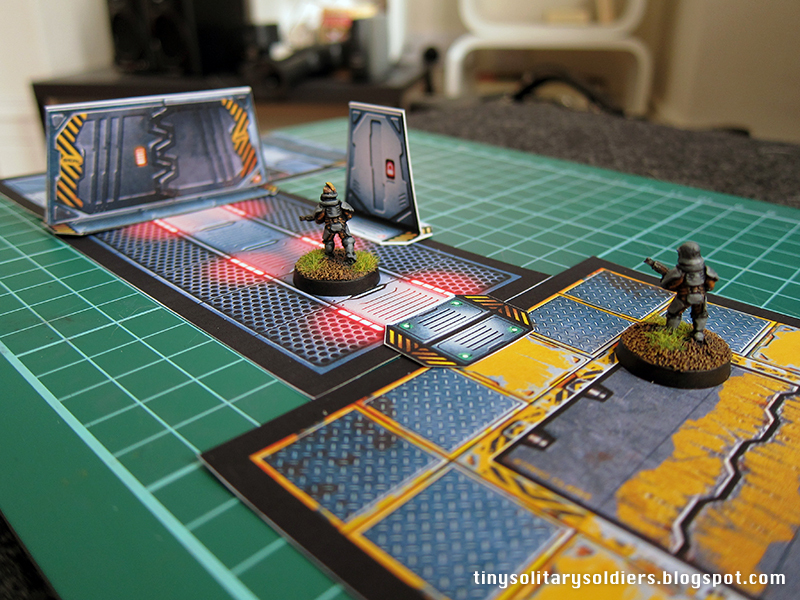 I have made these tiles for myself as much as anyone else so they are designed for maximum gaming flexibility in mind. YOU choose where and how many exits there are in any section simply by placing doors. Easy to cut, easy to use. 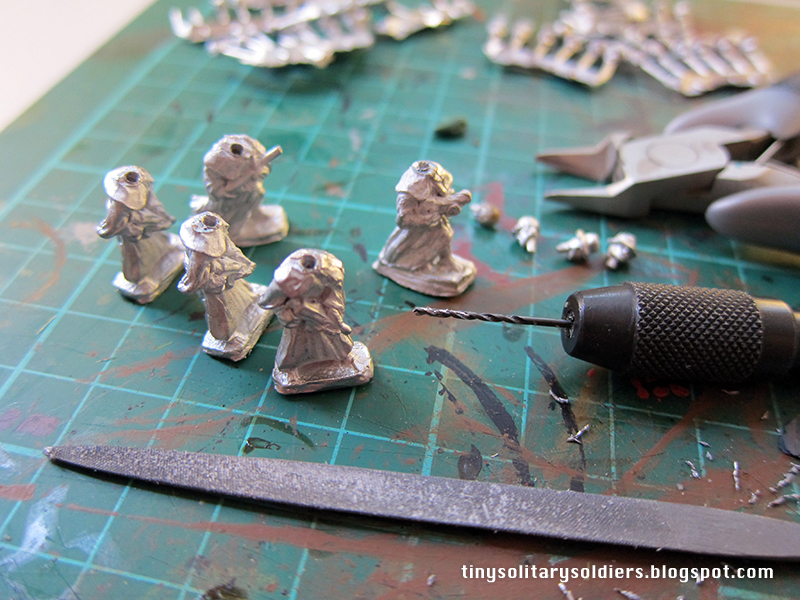 I had a few minutes today to chop the heads off my recent order of 15mm.co.uk hooded cultists and stick on some nicer ones. 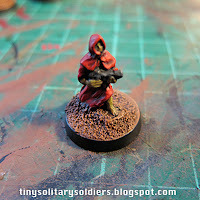 I added greenstuff hoods to try to blend them in with my nice Khurasan octo-god cultists. 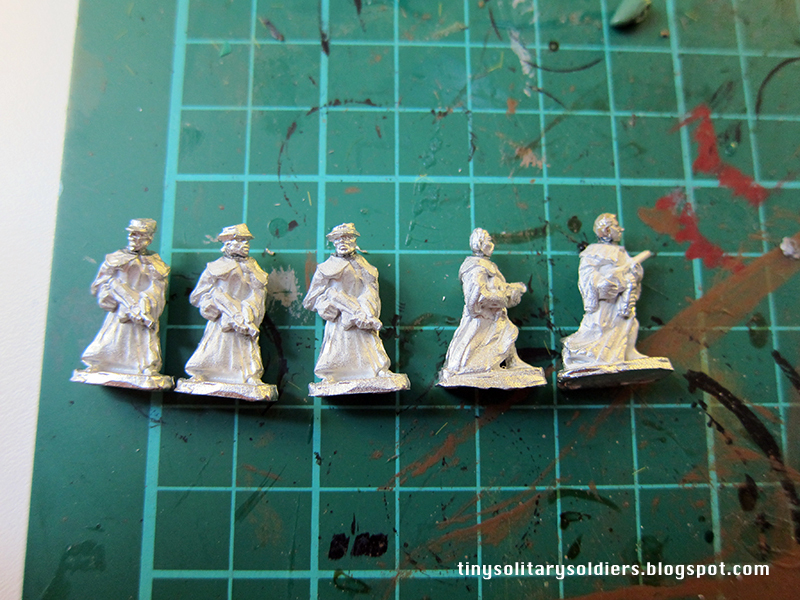 These troops will be hybrids or other unsavoury types (with GZG gas mask heads) led by an octo-god inner circle priest (with Khurasan octo-god cultist head). The original models are crudely sculpted and are on very thick bases, but make for some inexpensive "mook" figures. I think with a black basecoat and some careful painting they will look quite good when finished. I got sidetracked by building 3d furniture for these tiles using the sketchup program.. But today I got some more ink for my printer and did my test builds to make sure everything was OK. Here are the results, I'm very happy with how they turned out. I used matte photo paper to print them and found that as its a little thicker than normal paper, the doors are quite sturdy enough for gaming. I used a UHU glue stick to put them together. 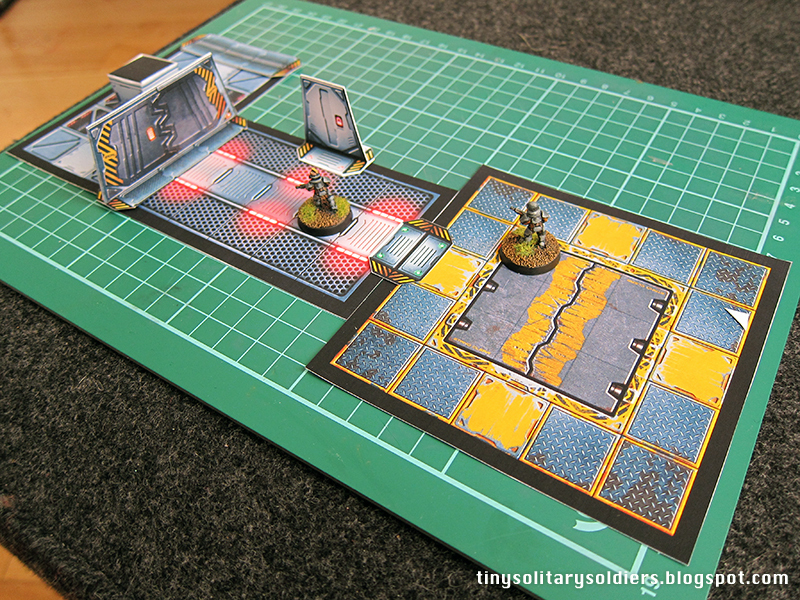 For a proper set, I'd glue the tiles to thick card or foamcore board. I've also had some ideas about using magnets to secure doors and scenery that I'll share when I have it all worked out. I'm emailing RPGnow today to get them available online ASAP. 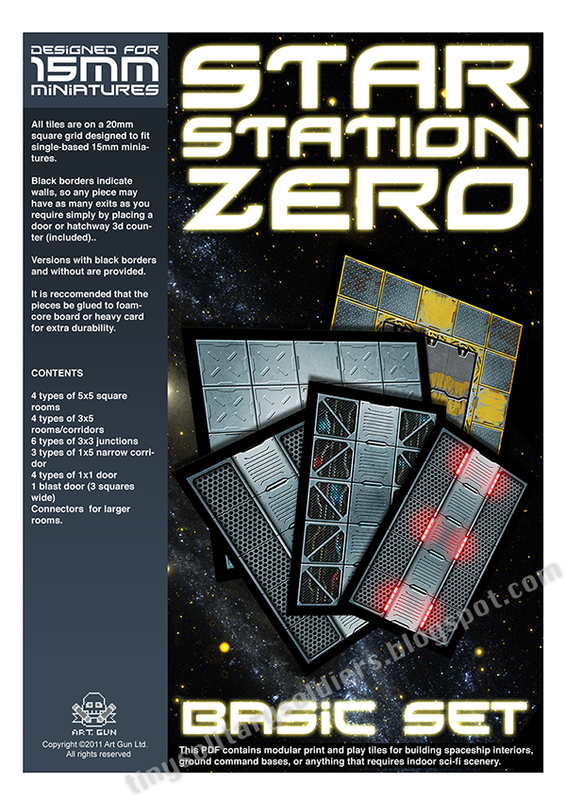 Surprise: 15mm starship deck plans! I have been hard at work on a long-forgotten project.. The 15mm deck plans that just keep getting hits despite me rarely mentioning them anymore.. In an effort to actually finish them I decided to scale back my initial idea to something more achievable. If they sell, I'll add all the special bits I have planned. The will be a set of 5x5, 3x3, 5x3, 1x3 tiles of 20mm squares. There will be enough variety to make a decent looking layout and I am planning on several different door types. I've done this first basic set with a 'clean' look for reasonably well maintained ships and facilities. 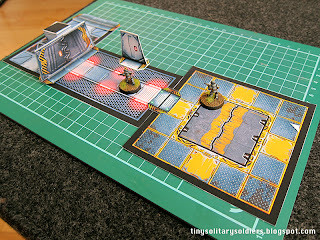 The black borders represent walls, so it is up to the customer to decide where the doors go to connect the pieces. This means you don't need dedicated junctions or corners... Very flexible. In future I have planned a rusted up junk-freighter set, an alien hive set, as well as more accessories. I've finished most of the tiles, just need to do the doors and tile spacers.. maybe add a little more detail. By the end of the week I hope to have them submitted to RPGnow and then hopefully for sale! A few days ago, my copy of Battlestations arrived. 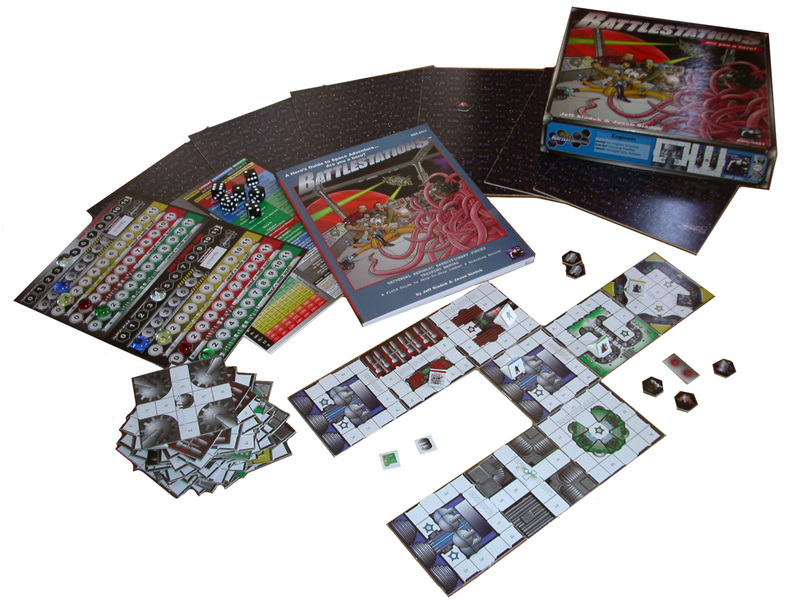 In short its a clever game that allows you to play shipboard actions and starship combat simultaneously. 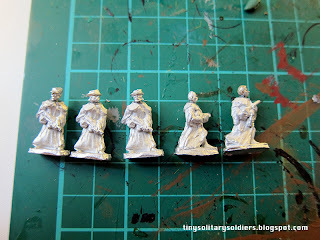 It has a supporting range of characterful 15mm miniatures as well, although they would not fit well with my collection. It's fairly complex and is intended as an RPG-hybrid board game that pits the players against a referee. This means it ought to be possible to Solo game. It's mechanics are easy to understand but the choices you have from turn to turn are fairly complex.. Meaning my only concern is that I'm not sure I could run an enemy ship/crew and my own one at the same time. This got me thinking about how solo skirmish gaming is almost more suited to RPG mechanics than those of a wargame. 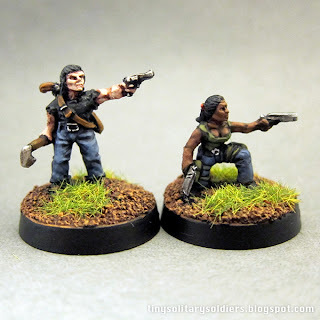 In my search for skirmish games that only use a small number of minis, I've also read that RPG rules are better for this. A long time ago, I purchased the Mythic GM emulator with the intention of using it to run a skirmish campaign. The more I think about it though, perhaps using a tactics-heavy yet freeform set of RPG combat rules might be a good way to go. I looked around the net for a free set that was reasonably modern and very quickly came across Old School Hack. I was amazed at how well written and tactically interesting this game is. If you're at all interested in RPGs, it's a free download and beautifully presented so have a look. It's not intended as a minis ruleset, but it's so clever that I'm going to have a crack at modding it up for small scale space skirmish using Mythic to be the GM. The secret is out! 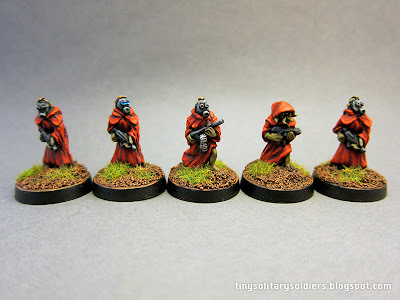 For those wondering why I haven't painted anything recently, it's not just that I got over-absorbed in Gut Check rules, it was that I had to paint these guys for Khurasan and not say anything about it. 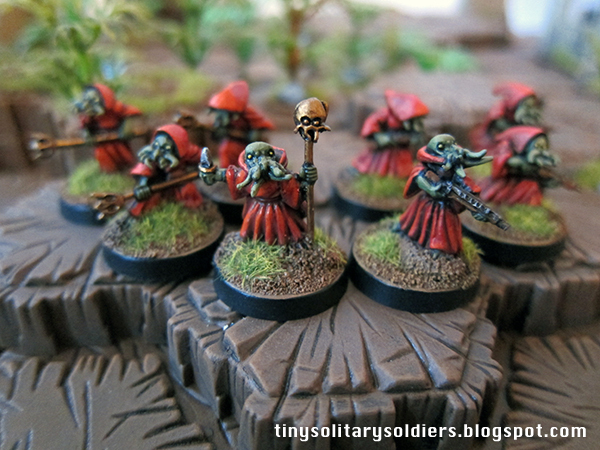 These cultists and Octopus god are amazing figures. 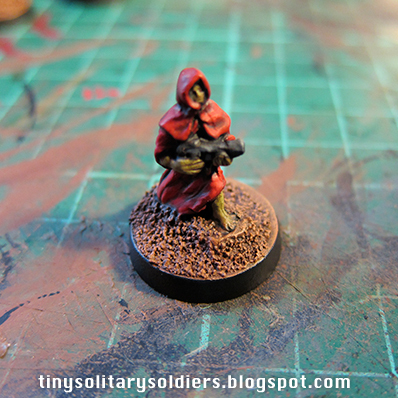 The cultists have separate heads so are perfect for conversions. They are beautifully sculpted and take paint very well. 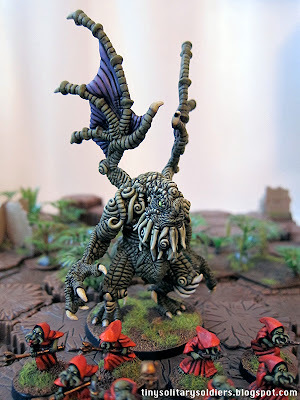 Painting the Octopus God got me thinking about Cthullu and I was looking at maybe getting a few 28mm figures.. Then I saw Jon's plans for the rest of the range and thought no way.. 15mm will be just fine thanks. 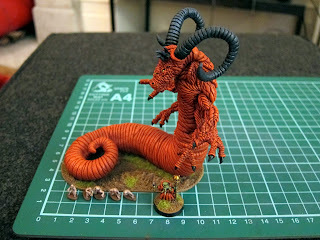 Anyway, enjoy the photos and pick up some of the minis if you can.. The best way to expand this range is to buy packs! 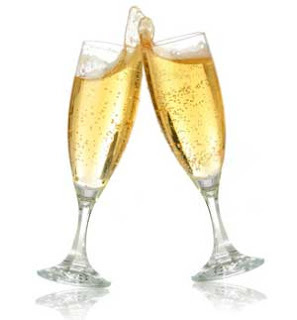 Congratulations to B.A.Kubacki, I have sent you an email requesting your address so I can ship you the minis. Commiserations to everyone else that entered, and thank you so much for your emails. I hope to do more competitions in the future.